Canvas @ YaleInstructor Guides SettingsHow do I re-organize my Course Navigation? 1. Select Settings from your Course Menu. 2. 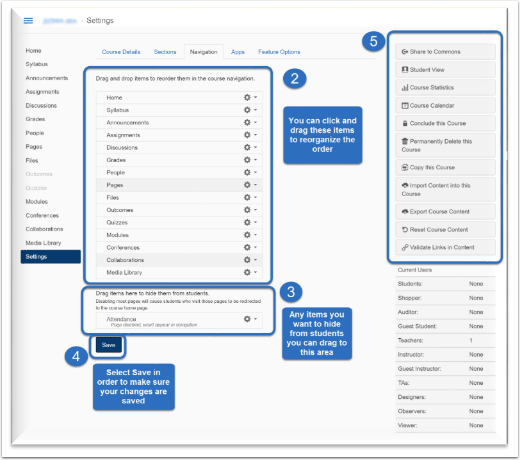 Modify your Course Menu order by clicking and dragging each item to where you would like. 3. Any menu item you would like to hide from student view you drag here. 4. Click Save in order to make your changes saved within the course. 5. These are additional settings you can use within your course. How do I create a web link in my Course Navigation?